There will always be periods where small caps underperform, but over the long term we believe the case for small caps to structurally outperform is stronger than ever. Reasons for this include the high level of inside ownership & alignment with investors. We like the leverage smalls have to M&A and smalls are typically less researched than large caps which give investors an ‘information bias’ if they do the work. In recent years, technology has become a huge enabler of small company growth, leaving large companies more exposed to new competition. A quick comparison of Afterpay and FlexiGroup in the consumer finance segment highlights how technology is enabling small caps to more effectively compete with incumbents. While constituents within the small ordinaries will change over time, we believe a select portfolio of small cap companies that exhibit the above characteristics will continue to outperform large caps over the long-term. Companies that are exposed to investment in mining and construction are very well positioned to deliver earnings growth into FY19. Australian businesses took a 5-year capital expenditure holiday from 2012, but it is now clear intentions have changed. A good data point supporting this view was the October NAB Business Conditions Survey which showed business conditions rose 7 points to +21 in October, the highest level since the survey began in 1997. The strong survey data was led by mining and construction. 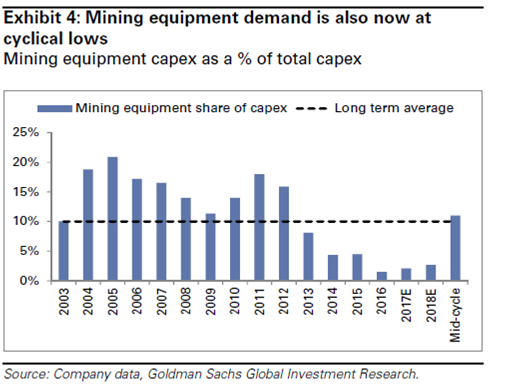 The chart below highlights how depressed mining equipment capex is and provides some insight to where mid cycle spend could be in 2020. By contrast, we think small cap tech stocks in Australia are overvalued across the board. We believe that mining services company, Emeco Holdings (EHL), can trade to 50c over the next two years, giving investors a potential 100% gain. Run-rate EBITDA is $140m and grew 7% sequentially in the September quarter. On our forecasts, the company can earn $200m of EBITDA in FY21 and the stock can trade on 8x EBITDA giving the business an Enterprise Value of $1.6B. Debt should have reduced to ~$200m by then which will see equity value for EHL of $1.4B or 50c a share. EHL is now recapitalised, divested offshore assets and consolidated the Australian mining equipment rental market. There are now 900 machines in the EHL fleet with operational utilisation running at 58% up from 52% in June quarter. Lead times for equipment have increased over the last 12 months, with lead times for 240 tonne trucks up from 3 months to 10 months as an example. Used equipment prices have also gradually increased over the last 2 years as the market has tightened. This all points to a sustained lift in utilisation rates which underpin our EBITDA expectations.